A few weeks ago, I previewed the MTA’s next-generation rolling stock. The R211s will feature wider doors and, at some point, open gangways, a design standard throughout the world. As I mentioned in December, though the MTA deserves praise for bringing an open-end car design to New York City, by delaying the arrival of the technology for so many years, the MTA sacrificed an 8-10 percent increase in capacity for decades. Cars that were purchased over the past ten years could have featured open gangways but did not, and these cars won’t be retired for another 40-50 years. The embrace of open gangways with the R211 order is a bittersweet moment to say the least, and one that still may not arrive. Last week, the MTA Board approved a massive purchase for new rolling stock. The MTA is going to spend over $1.4 billion on 535 new cars, 20 of which will feature the open gangway design. Kawaski will fulfill this contract, and the first part will feature rolling stock that costs $2.7 million per car, a number far out of line with international standards. As an example, London paid over $1 million less per car for its recent purchase of open-ended S7 and S8 cars for the the Metropolitan, District, Hammersmith & City, and Circle lines. The MTA’s new contract becomes somewhat more palatable if the future options are exercised. Kawasaki and the MTA agreed to an extension of $1.3 billion for 640 open gangway cars and an additional $913 million for 437 cars — or options for around $2 million per car with some adjustments for inflation. 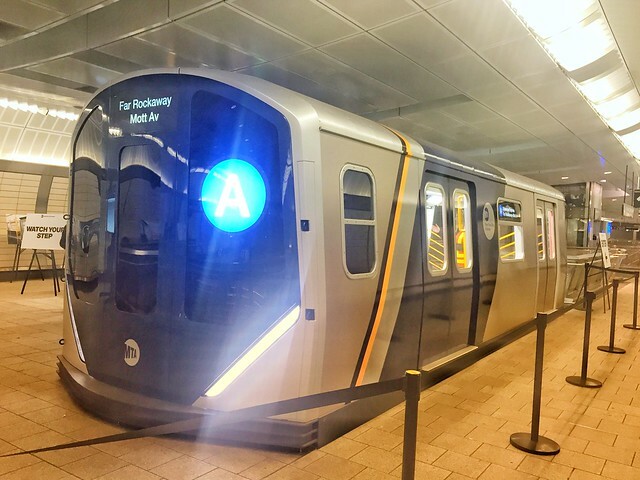 The contract, the MTA says, is “fair and reasonable,” and delivery of the open gangway prototypes is expected within 30 months, a very aggressive timeline for a new rolling stock contract. With or without open gangways, the new cars will feature 58-inch wide door widths that are eight inches wider than current cars. This new width should permit faster boardings, but the trains still feature enclosed doors so window space will be reduced. All R211s will be CBTC-compatible so at some point in the next few decades, the MTA will be able to provide more service. When that reality will emerge remains to be seen, but for now, new cars with open gangways are on the way. That is very much good news for New York City even if it is eight or ten years too late. Still awaiting the math on this. Paris has full-width open gangways with the same minimum curve radius as the IRT (40 meters on M1). Twenty cars with open gangways? No wonder I felt the earth move. An update to the Carol King classic, thanks for the idea. To add my own reaction: You know what would be nice? How about an announcement about replacing, starting right NOW, the faltering signal system? That would make the earth move for this fed-up subway user. Fare enough, but you need to replace the R-32’s through the R-68’s as well as they lack essential ADA features. Not this one, but there’s one below that was. I just thought of this song & posted a link. If a pun, then so much the better. If NYCT is no longer going to maintain the trains, buying new ones won’t help. Maintenance = cash today. New cars = debt paid for tomorrow. Yes, 8 to 10 years is a long time and since we have had to put up with Larry Reuter’s two step” (I’ve received 7 tickets for passing through cars and had them all dismissed. Ask me how!) having articulated open gangway equipment would be a marked improvement and would increase passenger safety. However, the sheer complexity of subway operations means we have to get it right the first time and not experience the trial and error other systems, especially London, went through with this equipment. We have to pay attention to how the sausage is made, given the environment all equipment has to operate in. So, I’d rather wait and get it right than the alternative. Here’s my question when it comes to subway cars. The earliest we’ll see the *test* R211s is 2020. We probably won’t have the full complement of new trains for a few years after that. The MTA is pledging enhanced service on the G line with full-length cars, enhanced service on the J/M/Z, and (if I recall correctly) full-length cars on the C line, when the L train shuts down. That’s in 2019. Where are those cars for the C, G, J, M, Z going to come from if there’s a gap of several years between the shutdown and the arrival of the new R211s? The L will still be running a good amount of its route (minus, obviously, the critical Brooklyn-Manhattan connection), so I’m envisioning not too many train sets will be coming off the L. I apologize if this is a stupid question that’s been addressed many times before. Actually not a stupid question at all. I imagine with a shorter L line, some cars can be deployed on other lines picking up a bit of slack. How much slack is an open gangway question though. The R179 order just recently started coming in. What about the door positions? Maintaining the same door position is the key to eventually having platform barriers. I continue to think the best solution is fixed barriers everywhere the doors are not. This maintains openings for ventilation, while reducing the area where people might fall by, what, 80 percent? Electric eye intrusion devices could cover the door gap. What will we do when there is a faeces-covered homeless person in an open-gangway carriage? You can’t move to the “next car” to avoid the gut-wrenching stench — all the inside is shared. How about buskers that perform cartwheels the entire length of the train? We need to clean out the subways of homeless and buskers/beggars before bringing sparkling new trains to NYC. What are we going to do?